When the Lord told Adam and Even to rule the world (Genesis 1:28), He was giving all mankind our first job description: lead. Yet, passages like Ephesians 5-6, Colossians 3-4, and the pastoral epistles (1 & 2 Timothy and Titus) clearly tell us that husbands are to lead their wives; parents are to lead their children; supervisors are to lead their subordinates; older men and women are to lead younger men and women, etc. And in Matthew 28:16-20, Jesus says that His followers are to lead all nations (ἔθνη ethne: ethnic groups or types of people) in His good news. But the world preaches so many messages on leadership that conflict with God’s Word. We can easily become confused. So, again, what should it look like to lead? Throughout this website, I define leadership in Christ simply as equipping and encouraging others to follow us to grow as a disciple (follower) of Jesus. The following may summarize the basics: we are to anticipate, initiate, train, and sustain. And counseling in Christ is helping those who are wayward or stuck to get back on track to following the Lord. But that’s the subject of another series. Leaders in Christ anticipate. They look ahead to see what our people will need even before they may know it’s coming. Biblical anticipation understands at least two things: 1) the Lord’s basic will is about loving Him and others (Matthew 22:36-40) as He has revealed in His Word. And 2) all creation is under the impact of sin and falls short of what real love should be (Genesis 6:5-6, Romans 3:23 and 8:22-23, etc.). In other words, the highway of this life is full of pot holes, broken bridges, and washed out roads that hinder our ability to move forward in real love. Leaders are to look ahead and identify those needs so they can prepare their people to love as well as possible. This is exactly what the prophets, priests, kings, apostles, and other godly leaders did throughout God’s Word. They listened to God’s Word, compared that to the situation of their people, and conducted a “gap analysis” to identify what was missing or distorted. The prophets received God’s Word about social injustices, corrupted teachings, neglected relationships, etc., and they came to point out the potential dangers ahead, primarily addressing those in positions of authority to care for others and to direct their people in good responses. The priests received God’s law that revealed guilt and uncleanness among His people, and they called them to offer sacrifices of repentance and faith in the One who accepts another’s death in our stead. The kings listened to the prophets and priests, and looked ahead to the threats of other ungodly kingdoms and protected them by their God-given might. For example, by God’s revelation, Joseph looked ahead, saw the famines coming and provided for Israel. The apostles and other disciples got to know specific groups of people and their unique struggles, looked ahead to their current course of living, and taught, exhorted, admonished, encouraged, and disciplined them to follow Christ, not merely their own thoughts or desires. Leaders must anticipate, not wait to react when the danger is already upon their people. Anticipating is innerpersonal. It begins with the Lord giving us understanding in what His Word says about love and opening our hearts to see the needs of our people. Initiating is interpersonal. It is connecting with those under our care as the next necessary step. If we only see what’s ahead but don’t do anything about it, we’re like that bank monitor in the TV commercial for security software. “I’m not a security officer. I’m just here to monitor potential problems. I don’t really do anything about them. (Then as the bank is being robbed), Oh…and you’re being robbed.” Sometimes when we initiate with others, they will appreciate it. Sometimes they won’t. But our children, subordinates, friends, and others still need us to step up and help. Help them how? That’s the third part. Leadersin Christ train. We give our people what they need to love well. When they have an immature spirit of self-indulgence, we train them by years of specific and patient instruction, encouragement, godly discipline, forgiveness, and commitment in Christ (Ephesians 6). When they are ignorant of God’s Word, we train them in understanding His Word (Acts 18:11). When they are so burdened that they can’t meet their basic responsibilities, we may help unburden them and then mentor them in life-skills to avoid similar pitfalls ahead (1 Timothy 5). Training may involve information, material, etc., but it is always the continuation of relationship, never substitutes for relationship. And that is the last part. And leaders in Christ sustain. At the risk of stating the obvious, we stay committed to the Lord and those He’s placed under our care. It’s worth noting that Scripture does not refer to Moses by the phrase “the servant of the Lord” until he died (Deuteronomy 34:5) having shown his commitment. His enduring faithfulness proved his genuinely godly leadership of Israel for God’s will, not his own. The same is true of Joshua (Joshua 24:29). For this reason, we are told that only those who persevere to the end are truly God’s people (Matthew 10:22, 24:13, Mark 13:13, 1 Corinthians 13:7, 2 Timothy 2:10-12, 1 John 2:19, etc.). Anyone can manage tasks, but only those who have been forgiving by Christ and changed by His Spirit will lead others in real love. Leading is not always glorious, though. Even a brief look at godly leaders in biblical times will reveal that they faced resistance from their own people, situational set-backs, personal failures, and other hardships. But when the Apostle Paul was exhorting leaders in the church as Thessalonica to be strong, he also encouraged them in the true hope of completing their work of holiness: “God is faithful, and He will do it.” (2 Thessalonians 5:24) In fact, that is the greatest joy of leadership in Christ: crying out to our good God who does what we can’t do for His glory and His love for His people. That is exactly what we see Moses doing through very hard times. Arguably, he was the greatest leader in the Old Testament, fulfilling the functions of God’s prophet, priest, and king, although certainly imperfectly. Still, you may find it helpful to read devotional thoughts on 12 times the Scriptures refer to Moses, Leading as a Servant of the Lord. Because leading can be difficult, I designed this website to provide you with many other tools for the trenches in your road ahead: devotional thoughts for those reading through the Bible in a year, Scriptures and related Christian music videos that teach and encourage, articles on current events from a Christian perspective, how to use physical exercise for small group Bible study and Christian fellowship, deeper theological studies such as 8 “P”s of the Gospel from Genesis 1 to Revelation 22, studies on “fruit” to be the fruit of God’s image and bear fruit, training videos and articles on Christian leadership and counseling, teaching videos on understanding and apply the Bible, reviews of Christian books and movies, and much more. I hope you find them helpful to your leadership, wherever the Lord has placed you to follow Him by faith for joy in Christ. 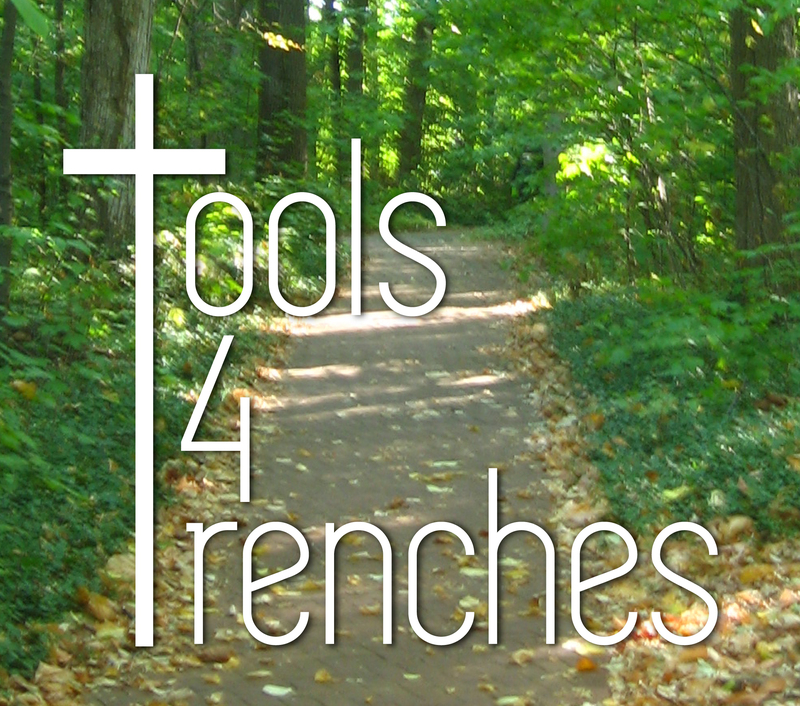 This entry was posted in tools4trenches and tagged leadership. Bookmark the permalink.